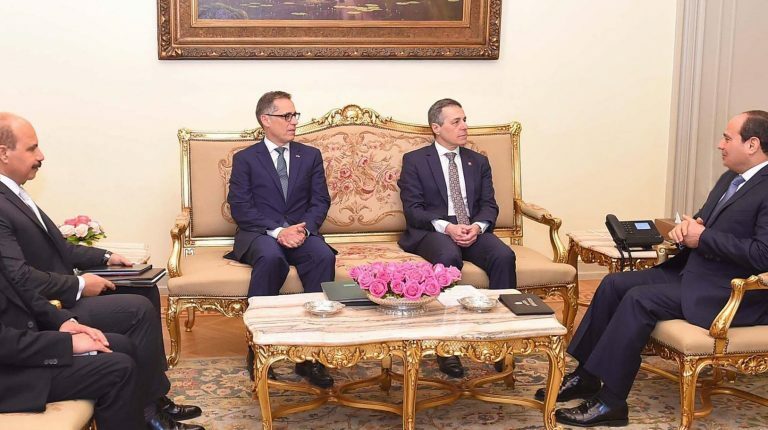 Egyptian President Abdel Fattah Al-Sisi met Monday with the Swiss Federal Councillor, Ignazio Cassis, where he reiterated Egypt’s keenness on boosting relations and cooperation with Switzerland in various fields, said presidential spokesman Bassam Rady. Cassis, met with Egypt’s Minister of Investment and International Cooperation, Sahar Nasr, as well as with the Foreign Minister, Sameh Shoukry, to discuss ways of boosting economic and political relations. “It is my first time to visit Egypt. It is important to boost economic relations with Egypt and increase Swiss investments,” Cassis remarked during the event which was organised by the Swiss embassy in Egypt on Sunday evening to celebrate 110 years of trade and economic relations with Egypt, in the presence of Nasr. The cooperation strategy with Switzerland until 2020 supports new projects which aim at sustainable economic growth and creating job opportunities, the statement added, noting that the new projects’ costs are worth about EGP 1.5bn. “We look forward to more joint cooperation with Switzerland in Africa, in line with Egypt’s presidency of the African Union in 2019,” Nasr stated, calling for new Swiss investments in the Egyptian market in view of Egypt’s enjoyment of new investment opportunities in new cities such as the New Administrative Capital and New Alamein City.